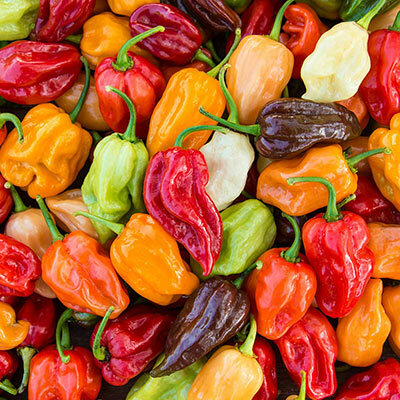 If you enjoy a variety of peppers, Flamethrower Hybrid Mix is a good one to grow. It includes six different varieties with flavors that range from mild all the way to super-hot. You'll experience Chiles, Jalapenos, Serranoes, Hungarian Hot Wax, Anaheim and Cayenne. Great for adding to salsas or they can be canned, dried or frozen. They're pretty, too, ripening to reds, oranges, browns and whites. For best results, start pepper seeds indoors and transplant seedlings outside after the danger of frost has passed. 70 DAYS. Form: Upright, mounded. Plant is compact for a habanero, with very open and spreading habit. Growth Rate: Average growth rate. Fruit: Typical habanero shape, slightly elongated, with thin, wrinkled skin. Slight scotch bonnet shape. Fruit generally 1 1/2 - 3 inches long. Fruity flavor with peppery heat that increases after eating. Mix of red, orange, brown, and white.